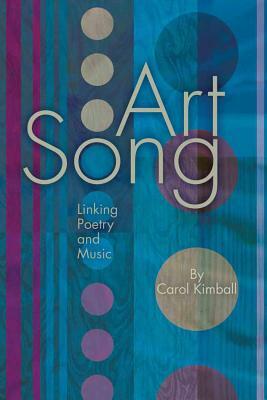 Art Song: Linking Poetry and Music is a follow-up to author Carol Kimball's bestselling Song: A Guide to Art Song Style and Literature . Rather than a general survey of art song literature the new book clearly and insightfully defines the fundamental characteristics of art song and the integral relationship between lyric poetry and its musical settings. Topics covered include poetry basics for singers exercises for singers in working with poetry insights into composers' musical settings of poetry building recital programs performance suggestions and recommended literature for college and university classical voice majors. The three appendices address further aspects of poetry guidelines for creating a recital program and representative classical voice recitals of various descriptions. Art Song: Linking Poetry and Music is extremely useful as an unofficial text for college/university vocal literature classes as an excellent resource for singers and voice teachers and of interest to all those who are fascinated by the rich legacy of the art song genre. Kimball's book gets to the heart of why we sing and gives us a process to follow in achieving greater understanding of poetry and its relationship to song...Kimball asks the right questions to direct the reader's mind toward every necessary angle that should be explored. -- American Music Teacher With her latest book Kimball makes another valuable contribution to the field with an exploration of the nature of art song...The author strikes a careful balance between practical and aesthetic issues...The successful performance of art song explains Kimball has many demands: thorough preparation of the text and music a collaborative kinship with the pianist charisma humility and dramatic imagination. The potential rewards for both the performers and the audience however are prodigious. 'Because individuality is our greatest asset we actually own every song we sing ' she writes. That ownership comes from a deep understanding of both the poetry and music. Art Song: Linking Poetry and Music is an outstanding guide to developing that comprehension. It is highly recommended. -- Journal of Singing.